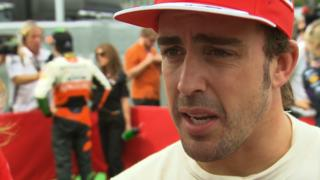 Ferrari driver Fernando Alonso describes the performance gap between Mercedes and the other teams as "amazing." The Spaniard double world champion describes a "tough" race where he struggled with "low grip" to finish sixth. A Mercedes car has led every lap of every race so far this season, their tally of 197 points is more than double that of second place Red Bull in the constructors' title.